It doesn’t sound like Johnny Sauter much likes the term NASCAR nomad when applied to his driving career and that’s understandable. There can be a lot of unflattering connotations connected to that description. And his grand plan when he decided to follow his father’s lead and become a race-car driver wasn’t exactly built around bouncing from team to team, year after year, so calling him a nomad must hurt from that standpoint a bit as well. But Sauter is an it-is-what-it-is kind of guy, and what his NASCAR career has been is transient. Take you where that may. Sauter has been in NASCAR for nine years now. At age 23, a year after winning the ASA championship as a rookie, he got his first ride in the series when he was hired by Richard Childress Racing to drive the No. 21 Busch Series car in 2001. That gig, which was for five races, started solidly as he posted a top-five finish in the race at Richmond. He would post top-15s in two of the other four runs in ’01. Impressed, Childress gave Sauter a full-time Busch ride for 2002. That year, he won at Chicagoland. Following that, the career movement, the living in a tent, began in earnest. In ’03, he shared a Childress ride with Kevin Harvick in the Busch series and also drove for Curb Racing. Sauter and Harvick won the owners championship for RCR in the No. 21 Payday car. In 2004, Sauter moved to the Brewco team in Busch and also drove 13 races for Childress in Cup. In 2005 and 2006, he drove a Sprint Cup car for James Finch. The next season, he moved to Haas CNC in Cup. Last year, he started with Finch again, raced five times and was let go. He then went back to Haas CNC after that team let Jeremy Mayfield go. Built around all that there were odd starts at all levels of NASCAR’s big three series. Heading out of the 2008 season, Sauter, in all, had started 76 Sprint Cup races, 195 Nationwide races and 11 Camping World Truck Series races. Nope, not the plan when he graduated from high school in Necedah, Wis. in 1996. That plan was the same one that every young stock-car driver has, but only a handful get to make come to fruition. The process of getting and holding one of those 43 jobs is a lot more complicated than just developing skill sets behind the wheel. Heck, the short tracks are brimming over with skillful drivers in this country. It takes being in the right place at the right time and getting into the right situation at the right time. Sauter, for instance, landed what looks today like a big fish of a job when he was hired by Childress. But back then, from 2002 to 2006, RCR was a team in transition. It was not a top-tier team in those days. When Sauter was given a Cup ride by Childress in ’04, the other drivers were Robby Gordon and Kevin Harvick. Sauter lasted 13 races with a best finish of 14th, which he did twice. From there, it was on to Cup teams like Haas CNC (which has become Stewart Haas and highly successful) and Finch’s Miccosukee team (which is now showing signs of life) which were have-nots when he was there. “Timing is everything,” Sauter says with an uneasy laugh. Time is important, too. Sauter turned 31 years old in May this year. That’s young, unless your are a NASCAR driver. Then, it is middle age. It’s the age that unless you are an established star, your options – and plans – begin to narrow. 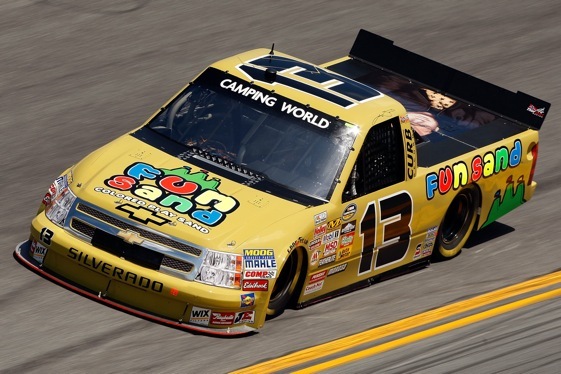 Sauter’s best option for the current season became a Camping World Truck Series ride. It’s a ride with the team owned by Duke Thorson and it’s full time. And – lo and behold, as he would say – it’s great, Sauter said. First off, it’s great for blood pressure. Second off, things are looking good on the competition front for Sauter and his team. After a rough start, the team has posted three top-15 finishes in the last three races. Sauter’s best finish, fifth, came last weekend in Dover. “We’re figuring this thing out,” he said. “We’re making progress. It feels good, but does it feel like Sauter has finally found a home in NASCAR? The other half may be keeping his nomadic urges in check.